Family Dentist in Costa Mesa Adopts Local Family for Christmas! 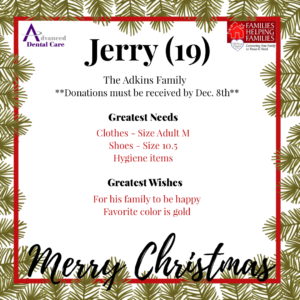 This year our team has graciously adopted The Adkins Family. Jen is a single mother of FIVE kids! She has 4 boys from ages 7-19 and one girl who is 11. 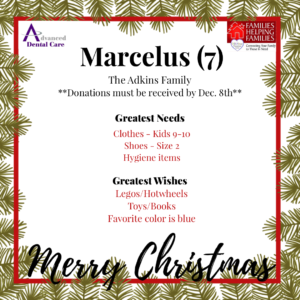 The Adkins really need our help this year and have asked for just basic items such as clothing, shoes, and personal hygiene products. The families greatest wishes are to be able to spend time together doing activities in OC or just getting to share a meal together. 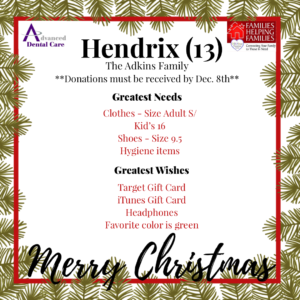 We hope you can join our Costa Mesa Family Dentist in making the Adkins Family Christmas the best one yet! All donations must be dropped off to our office no later than Saturday, December 8th at 12:00pm. Please do not wrap the items as we are required to compile a list of things we are donating. See our Facebook event for more information. Thank you in advance and Happy Holidays to all! Advanced Dental Care is owned by Dr. Jeremy Jorgenson, a family dentist in Costa Mesa, CA. Dr. Jorgenson loves seeing family members of all ages and specializes in restorative and cosmetic dentistry. For more information, please call anytime at (714) 424-9099 or chat live with one of our knowledgeable team members at www.mycostamesadentist.com!